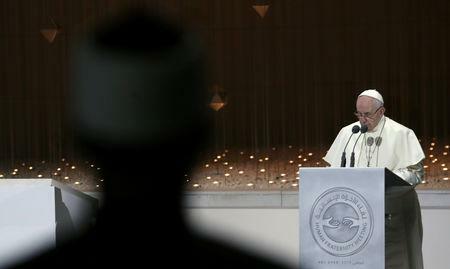 ABU DHABI (Reuters) - Pope Francis denounced the "logic of armed power" in Yemen, Syria and other Middle East wars on Monday on a landmark visit to the Arabian peninsula where Islam emerged, telling Christians and Muslims that conflicts brought nothing but misery and death. Francis, the first pontiff to set foot on the peninsula, was speaking during a trip to the United Arab Emirates, which is playing a leading role in Yemen's conflict as part of a Saudi-led military coalition. 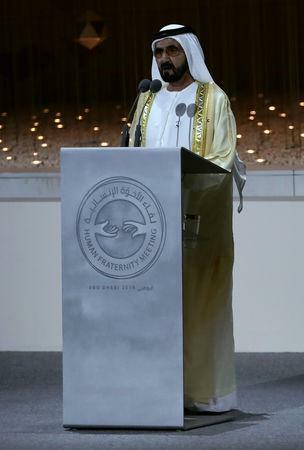 "War cannot create anything but misery, weapons bring nothing but death," he said in a speech after meeting UAE leaders in the capital Abu Dhabi on Monday, the first full day of a trip he hopes will foster peace through religious dialogue. "Its fateful consequences are before our eyes. I am thinking in particular of Yemen, Syria, Iraq and Libya," he said at an inter-religious meeting at the UAE Founder's Memorial. "Let us commit ourselves against the logic of armed power," he said in his first public address on the trip after meeting with Sheikh Ahmed al-Tayeb, the Grand Imam of Egypt’s Al-Azhar mosque who called on Muslims in the Middle East to embrace Christians. The United Nations is trying to implement a fragile ceasefire deal in the country's main Hodeidah port, a lifeline for millions and the site of some of the war's fiercest battles. It hopes the deal will pave the way for talks to end the war. A senior UAE official welcomed his comments on the peace deal: "Let us assure its implementation and make 2019 the year of peace in Yemen," Minister of State for Foreign Affairs Anwar Gargash wrote on Twitter late on Sunday. "You are citizens with full rights and responsibilities," said Sheikh Tayeb, whose Al-Azhar university represents one of one of the main seats of learning of Sunni Islam. He also called on Muslims in the West to integrate in their host nations and respect local laws. 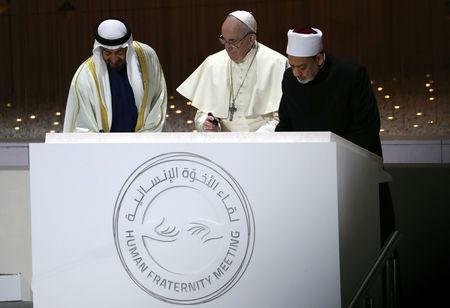 Sheikh Tayeb and the pope signed a document of "human fraternity" which carried a message against religious extremism. Earlier on Monday the Pope was welcomed to the sprawling Presidential Palace for private talks with Abu Dhabi's Crown Prince Sheikh Mohammed bin Zayed al-Nahyan and other UAE leaders. The visit received some positive media attention in neighbouring Saudi Arabia, home to Islam's holiest sites and where churches are banned. The main English daily, Arab News, ran a picture of the pope and Abu Dhabi's crown prince calling it "the moment that made history on the Arabian Peninsula."